Playing Time around 90 min. Trade, raid and settle the world of Middle Ages Europe. Sail the seas to the end of the world. Fight bravely under the Raven's banner and bravely enter Valhalla! Make the civilized world tremble and priests fervently pray "Lord, save us from the fury of the Northmen". 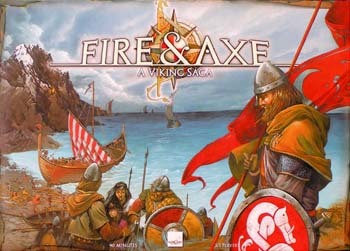 Fire & Axe gives players a chance to take on the role of Vikings traveling between 750 and 1020. Each journey begins in Scandinavia, where crewmen and goods are loaded and the runes cast. During the journey, you will trade with the locals, raid them for treasure or try to establish settlements. If you can, you may try to accomplish sagas which will be repeated by the skalds. The speed at which you will gain riches and notoriety will determine how great a mark your Viking will have left on Middle Ages Europe.